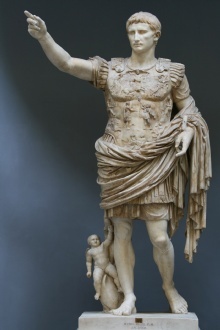 Augustus was a famous Royalty from Rome, who lived between 63 BC and 14 AC. Gaius Julius Caesar Augustus (born in Rome, died in Campania) was the great-nephew of Julius Caesar and became the first Roman emperor. He was born as Gaius Octavius ​​and was then Gaius Julius Caesar Octavianus after being adopted by uncle. Although he retained the outward form of the Roman Republic, he reigned as the autocrat for more than 40 years. He ended a century of civil wars and gave Rome a period of peace, prosperity and imperial greatness, pax romana (Roman peace), which lasted for 200 years. He is among historians known as Augustus, a title he received at his accession as emperor 27 BC Despite his poor health was Augustus 77 years old and was emperor for 41 years. He was succeeded by his stepson Tiberius. The young Octavius ​​was his inheritance after Caesar was assassinated in 44 BC The following year he went along with Marcus Antonius and Marcus Aemilius Lepidus in a military dictatorship known as the Second Triumvirate. As a triumvir Octavius ​​ruled Rome and many of its provinces. Triumvirate, tremannsveldet, fell at last from each other due to that the three had conflicting and competing ambitions: Lepidus was driven into exile, and Antony committed suicide after their defeat at the Battle of Actium against Octavius' fleet under the command of Marcus Agrippa in 31 Vipsanius f Kr. After the second triumvirate Octavius ​​restored the exterior facade of the Roman republic in which government power was the Roman Senate, but in practice retained his autocratic power. It took several years to determine the precise framework for how the name republican government would be headed by a single ruler, the result was the Roman Empire. The empire was never a position that the Roman dictatorship which Caesar and Sulla held before him, actually declined Octavius ​​it when people "offered him to take position as dictator." He was not in his life known what today is called "Emperor"; imperator was (at first) only a title given to an unusually successful and accomplished general. But Augustus was given, among other titles, that of princeps, "the first (among citizens)." Initially it had no royal connotations. The law had Augustus gathered the powers given to him for life by the Senate, including those that tribune of the people and the censors. He was consul until 23 BC His main power had a background in financial success and resources that he had obtained by conquest, the development of numerous loyal allies who sought his protection over the whole kingdom, the loyalty of many soldiers and veterans, the authority of the many honors that were given to him by the Senate and respect and good will of the people. Augustus' control of most of Rome's legions established an armed threat that could be used against the Senate at any time, which made it possible for him to force through decisions in the Senate. With its ability to eliminate opposition in the Senate by force of arms came to the Senate to join him docile. His control through protection of the loyal military force, and the accumulation of positions and offices in their own hands from the late Republic was the model for all later emperors. Board of Augustus initiated an era of relative peace known as Pax Romana, or Roman peace. Despite the smooth and uninterrupted wars at the borders, and one årslange civil war over the imperial succession, remained the world around the Mediterranean in peace for more than two centuries. Augustus, the Roman Empire increased dramatically, annexed Egypt, Dalmatia, Pannonia, and Raetia, expanded possessions in Africa and completed the conquest of Hispania. Beyond the limits he secured the realm of client kingdoms and entered into a peace treaty with Parthia in the East through diplomacy. He reformed the Roman tax system, developed a solid network of roads with an official courier system, established a standing army, established pretorianergarden and established an official police and fire protection service to Rome. Much of the city was rebuilt under Augustus, and he wrote a record of what he had achieved, known as the Res Gestae Divi Augusti, who survived. At his death in 14 CE Augustus was declared a god by the Senate - that is to say that he deserved to be worshiped by the Romans. His name Augustus and Caesar were taken over by all subsequent emperors, and the eighth month in the Roman calendar, formerly called Sextilis, was renamed Augustus (August in Norwegian) in his honor. He was succeeded by his adopted son (who was also his stepson and former in-law), Tiberius. Our collection contains 3 quotes who is written / told by Augustus. "Young men, hear an old man to whom old men hearkened when he was young"